When you're elected to plan the celebration for an outdoor event, your first move is to establish the gathering space. Our tent or canopy rentals are a great way to provide shade or rain protection for all your guests. 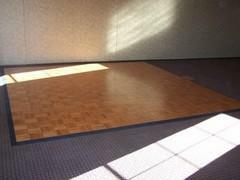 Maybe you would like to make your event a little more special with an elegant dance floor. Our stages really raise your event to new heights with adjustable legs from 6" to 3ft. We can add stairs or rails to help make it safer. All rentals for 3 days. Mon-Fri pickup or delivery ONLY! Return any day. Schedule accordingly.